Color shown is Dark Brown stain---This listing is for GREEN-BROWN (Weathered Bronze) stain ONLY. Other colors available in separate listing. Each casting is hand finished using an antiquing stain that permanently changes the exterior surface to one of the colors listed above. 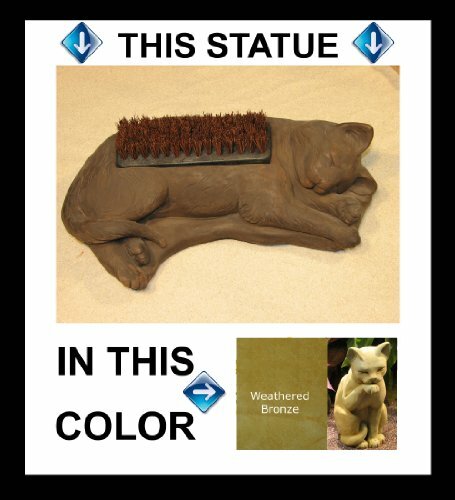 Due to the nature of this process, each casting will have subtle variations in the color, giving your statue an individual and unique character. As your statue ages, it will develop its own darkening - or patina. Garden statues are made in the USA of a copyrighted poured concrete mixture. These are considered "frost resistant" and can be used in most any climate. From conception to completion, our products are considered pieces of art. Proper care will only extend the amount of enjoyment you receive from owning these unique stone statues. The manufacturer of this statuary is also a licensee of the Frank Lloyd Wright Foundation, assuring you pure quality and workmanship. For more information, please do not hesitate to contact us!